This month we’re dreaming of warmer days and helping to get your beach house, lake house or other retreat ready for the season. Not only are we offering a great promotion on furniture for your coastal living space in January, but we’re bringing you tons of advice on indoor and outdoor spaces. Outdoor is the new indoor! No longer is outdoor seating limited to cushions separate from frames. Now you can create an outdoor space that is as comfortable and cozy as your living room. 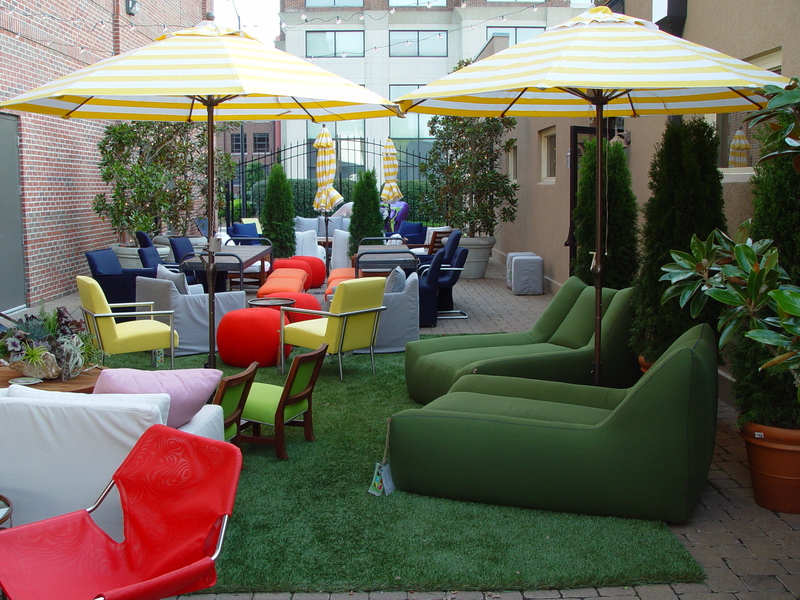 For fully upholstered outdoor furniture, we recommend Lee Uncovered from Lee Industries. An established leader in furnishings business, Lee Uncovered is a marriage of fashion forward design and strategic engineering. Inside each Lee Uncovered chair or sofa is a frame constructed from outdoor grade sustainable birch plywood. Frames are assembled with waterproof adhesive and stainless steel staples and fasteners so they can hold up to even the roughest outdoor environments. Considerate design includes a drain built into the frame of seating and special webbing that allows water to empty out quickly. Combined with mildew resistant foam cushions and performance fabrics that are fade, stain, water, UV and mildew resistant, Lee Uncovered is a great match for the elements at your beach or lake house. We love the bright upholstery showcased at High Point Market in the Spring Lee Uncovered showroom. If you are looking for durable outdoor furniture that will last a lifetime, you should also consider high-end powder-coated aluminum. Tropitone Outdoor Patio Furniture was founded by a retired Lockheed Aircraft engineer in the mid-1950s. The engineering that went into developing the aluminum-framed designs was originally targeted exclusively to the commercial market. However, while hotels, spas and resorts still turn to Tropitone for top quality, the company now offers residential customers the chance to purchase their fashion-forward designs. Tropitone outdoor patio furniture covers the spectrum of styles ranging from contemporary to traditional with some transitional, in-between styles available. Made primarily with beautiful, versatile, durable aluminum frames, Tropitone construction is designed to weather the elements. Sunset West outdoor dining tables can accommodate a crowd and, thanks to top-notch construction, weather the storm. When it comes to aluminum framed lounge furniture, our collections from Sunset West are popular. Our clients like to incorporate these pieces at their beach houses because of they are so durable. We recommend them – as do our interior designer clients – because of their generous variety of fashionable looks. Sunset West branded products carry a five year warranty on frames and a three year warranty on powder coated finishes. Their cushions are made with all water materials and covered in Sunbrella fabrics. And they carry a warranty too for the first year. Sunset West seating is ample and comfortable. We recommend the La Jolla collection for your contemporary or transitional outdoor space. They are also supremely comfortable. With deep seating (just take a look at the La Jolla collection pictured above) their outdoor lounge furniture offers the perfect place to kick back with a cold beverage and watch the sunset over the beach. This entry was posted in Favorites and tagged Coastal Living, lee furniture, outdoor furniture, sunset west, Tropitone by James Craig Furnishings. Bookmark the permalink.